Thank you to the following shops and guilds who have invited me to visit for teaching and/or vending! I can't wait to catch up with old friends and meet new ones at the following locations! If you are in the area, please consider stopping by and participating! One S1ster Studio will open 3 days only! I am available to come and teach workshops and trunk shows. My two most popular classes are for hand applique using the needle turn method, and for my crazy piecing technique. These are both project based classes, where the students work on their project (not just an applique sample, for instance). 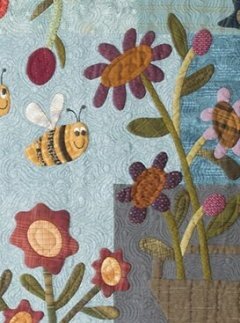 Although I've selected a photo for the applique class, the shop, or group, can feel free to select from any of my applique projects as a class project. For the "Stitch Like Crazy" class, each student will get to select their own project making this is a fun, fabulous, and yes, crazy class! Contact me to schedule your event! 6 hour class skill level: beginner I teach needle turn applique, a method I think is easier to prepare and gets student stitching quickly. I discuss why I use the supplies I do, and one that is noticeably absent are the pins! This is a pin free method making your applique easily portable-no more worry about losing or sitting on a pin in the car! I will also explain how to prepare the motif so that its ready for placement onto your background, light or dark, it doesn't matter with this method! During the stitching phase of class, I will explain how to achieve a sharp point at each star point and I even have a trick for keeping threads from unraveling in the valleys. We finish up class with learning how to make bias for vines. This is a very comprehensive class and students learn a lot! I've always said: "if you can stitch down a binding on a quilt, then you can applique!" 6 hours Skill level: Beginner In this class, students can select ANY crazy quilt from any One Sister or Buggy Barn publication. That's right-each student could potentially be making a different quilt! This is a fun class and students learn my popular "crazy" piecing technique (stacking fabric, cutting on the lines, shuffling, and stitching it all together). 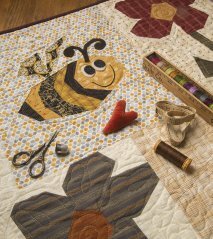 This trademark piecing method is easy and forgiving, ensuring quilting success for piecers of all levels. 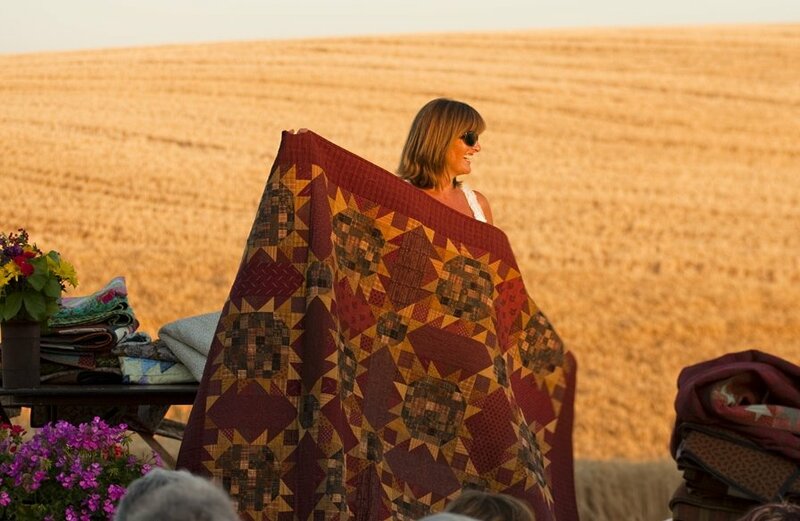 This fun technique keeps you coming back for more, one quilt after another, and will keep you "piecing like crazy" long after the class is over!